If you’re looking for a high quality bed and breakfast in Auckland, New Zealand, look no further than Braemar. After ten years of restoration, John and Susan Sweetman have transformed the turn of the century manion into an elegant, luxurious bed and breakfast. Located on Parliament St., Braemar is the only late Victorian townhouse in the Central Business District still used as a residence. Although it’s located in a central location, Braemar remains a relaxing getaway with plenty of space for thoughtful reflection. 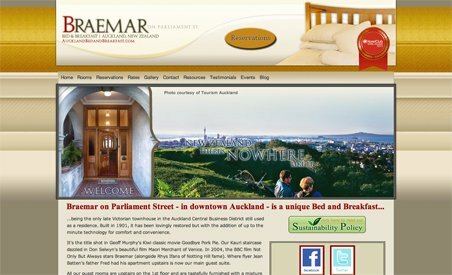 If you’re looking for a high quality bed and breakfast in Auckland, New Zealand, look no further than Braemar. After ten years of restoration, John and Susan Sweetman have transformed the turn of the century manion into an elegant, luxurious bed and breakfast. Located on Parliament St., Braemar is the only late Victorian townhouse in the Central Business District still used as a residence. Although it’s located in a central location, Braemar remains a relaxing getaway with plenty of space for thoughtful reflection. Guests have full use of the large living and dining rooms and private library, and each bedroom has orthopedic mattresses, quality furnishings and high ceilings. Braemar is ideally suited for all travelers, as it is close to the University of Auckland, the Auckland University of Technology and the vibrant downtown core.